I’ve long wondered just what goes on in a design meeting at Honda. They’re such a conservative company in so many ways, and yet every now and again there is some sort of corporate spasm that provokes the development of something just a little special. Sometimes, of course, it’s also a little bit over the top, like the engineering masterpiece that was the NR750, a fantastic bike but so expensive that nobody bought one. Or a technically advanced solution to a problem that no longer exists, like the inboard discs on almost all sporty Hondas in the mid eighties. 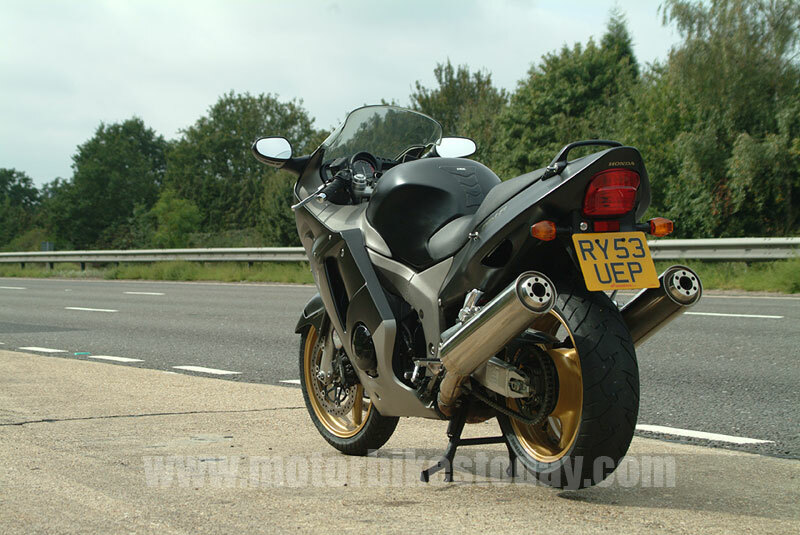 Then again, of course, sometimes it’s the Fireblade – a stroke of genius that turned conventional sportsbike thinking on its head overnight. And, of course, the Blackbird. You can picture it now. Lots of suited Japanese gentlemen earnestly discussing The Way Forward. Someone says “Hey Boss! Why don’t we make the fastest bike anyone has ever seen?” And there’s this long, long silence. They all stare and look at the floor and shuffle their feet uncomfortably. Then the boss grins and all of a sudden they’re all nodding and smiling and clapping the guy on the back. Anyhow, back to the bike. 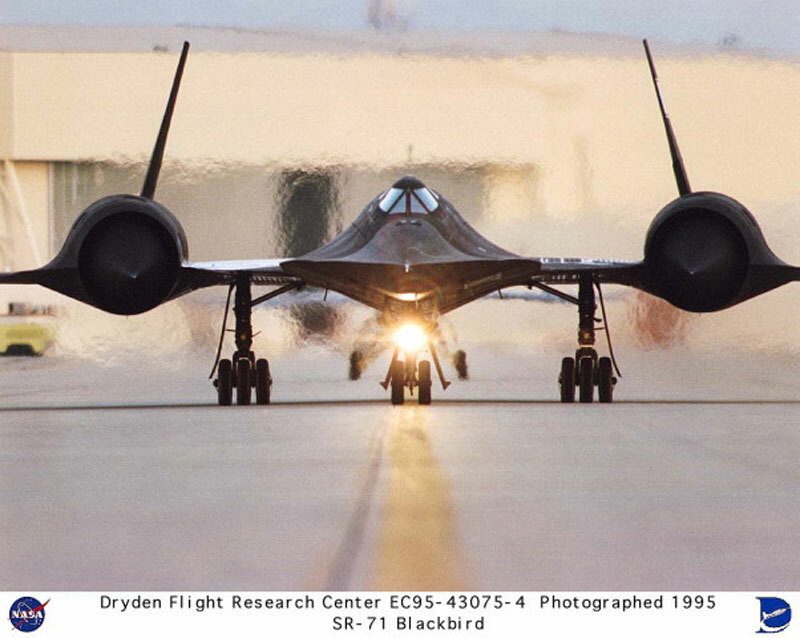 When it was launched, the Blackbird raised a few eyebrows. Not just because of the frankly silly top speed. But because it appeared to be something that nobody had ever really made before. An extremely fast but almost completely sensible bike. 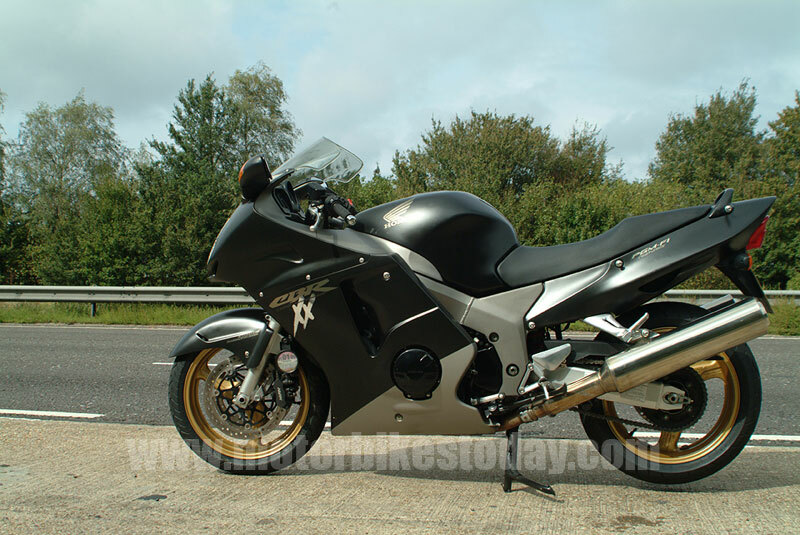 A decent fairing, comfortable seat and terribly grown up linked brakes. Handling on the sporting side. But a centre stand, a grab rail and enormous headlights made for a far more rounded package than we expected. 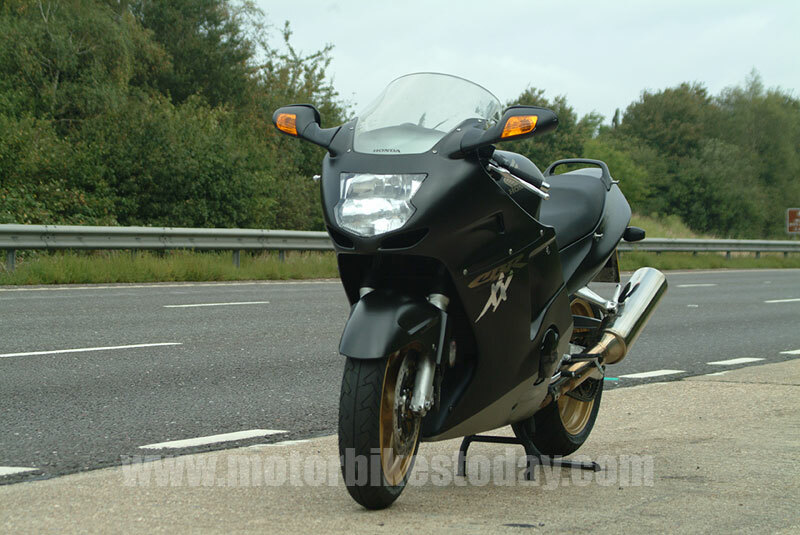 The first incarnation of the Blackbird, or CBR1100XX Super Blackbird to use its full, snappy title, was blessed with carburettors and, truth be told, was quick but nowhere near as quick as the hype. The next year saw no more than a colour change, but Honda being Honda, and market forces being what they are, the year after saw some more significant changes in an attempt to beat the Hyabusa and ZX-12. Actually, it’s probably fairer to say that Honda realised they were never going to beat the other two on sheer speed and power so they went for usability instead. Fuel injection, better brakes and suspension enhancements were meant to make the Blackbird into an urbane super cruiser. And they worked, too. Approach the Blackbird and, like it’s Lockheed namesake, the first thing that strikes you is the size. It’s really quite a large motorbike, a rarity as bikes become ever smaller, and it’s heavy too. The matt black paintwork with pale gold wheels and titanium detailing echoes the aeroplane even further. 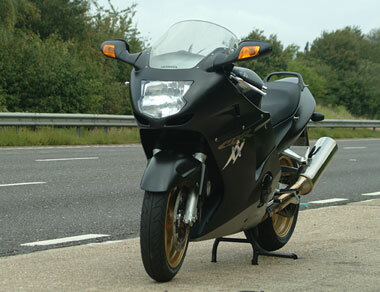 A stealth motorbike, even a pseudo stealth one, is unusual and in honesty I don’t think many shapes could carry it off. This, however, can, managing to look classy and somehow sinister at the same time. Chalk one up for the Honda creative people as well then. But we don’t buy motorbikes to look at them, do we. Hauling the Blackbird off the centrestand is one of those things that actually seems far harder than it is, but it’s approached with trepidation the first time anyway. No problem, balanced on the sidestand and swing a leg over the surprisingly low seat. In a typical Honda way, everything fall exactly where you would expect and hope it to be. the instruments are clear though slightly dated in layout, the bars are just the right height and reach and the mirrors give a pleasing view of the scenery behind me with barely an elbow in sight. So on board and comfortable it’s time to get moving. Start the engine. Check that the tacho is actually registering and that the oil light has gone out. There is a little noise, its true, but no vibration whatsoever. This really is like a jet. 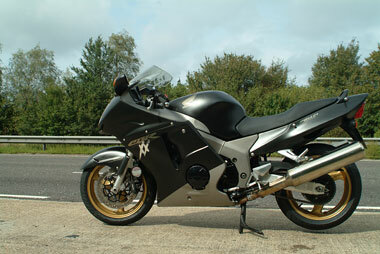 There is an immense feeling of potency from the 1100cc engine but it is so incredibly smooth. I am impressed. Pull in the pleasantly light clutch, engage first and pull away. At any revs at all. There is a huge amount of low down torque and the transition from stationary to urban speed limit is almost instant. 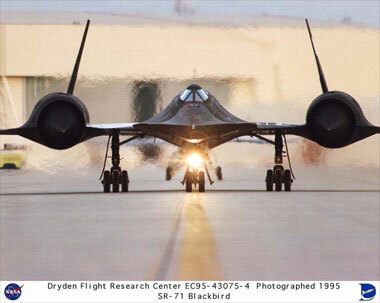 While we’re talking about outright performance, it’s probably worth mentioning that the Super Blackbird, even in this stealth colour scheme, is not radar invisible. We know because we tested it, fortunately without the benefit of a ticket afterwards – the wonders of a controlled environment. On the move and it’s time for a cliché. The weight simply disappears. And it’s true – the weight really does stop being an issue as soon as the Blackbird is moving. What seems unwieldy and threatening at a standstill becomes stable and reassuring at town speeds and even more stable and reassuring at Autobahn speeds. And when it comes to Autobahn speeds, the big Honda has it right. I sat at well over 130mph for just about a full tank of fuel. Just because I could. The Blackbird didn’t even break a sweat. And I was perfectly relaxed – exactly the way you want to be when you’re going somewhere in a hurry and don’t want to be completely strung out when you get there. Off the major routes and onto roads which are rather less boring and the Blackbird is still a worthy companion. Handling is a little slow, but then again we are talking about a big, heavy bikes here, not a nimble little supersports machine. 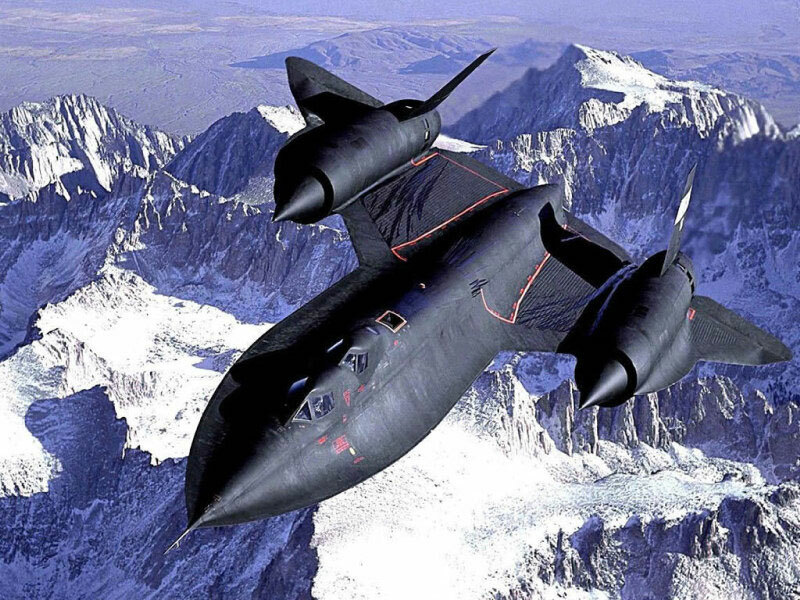 The Blackbird turns in remarkably well, in fact, and is utterly predictable in the process. Stability is beyond reproach and, as we have found several times this year, this particular bike doesn’t mind whether you want to hang off or not. In this case I chose not to, and experienced no ill effects at all. Now all this performance is only as good, at the end of the day, as the brakes. And, though I’m not the greatest fan of linked brakes, as ever these are very good. You have to give Honda some credit for the way that they take an idea and stick with it, even in the face of some criticism, and refine it and polish it until it actually becomes close to the benefit that it was always supposed to be. I still prefer normal braking systems, but the Blackbird’s stoppers proved well up to the task in hand, scrubbing off enormous amounts of energy without complaint or problems. The Blackbird doesn’t look as though the fairing will be especially effective. It’s streamlined, sure, but it’s hardly a tall screen. So the actual effectiveness was a pleasant surprise. I stayed warm, dry and largely unaffected by the hurricane speed gale I was generating for myself. Staying warm was certainly helped by the huge amount of heat produced by the turbine plant masquerading as an engine. I’d sure want to keep moving in high summer. Despite the available performance and the liberal use I made of it, the Blackbird still took me a comfortable 180 miles before needing to refuel, and the chain showed little sign of stretch, unlike a competitor we rode a while ago which ate the chain in a few thousand miles. Tyres were new when we picked the ‘Bird up and, though still good, had clearly been worked fairly hard by the end of the test. Brake pads had an immense amount of meat still on them, and it will be no surprise to hear that neither oil nor water levels moved at all during the test. Today’s CBR1100XX Super Blackbird is a sophisticated, refined, comfortable way of covering large distances at very, very high speeds indeed. Having ridden all the current competition I make no bones about saying, categorically, that though the others may be a little faster (or even quite a lot faster) there is no doubt in my mind which one I would rather cover a long distance on. Several hundred miles left me comfortable, relaxed and absolutely free of the aches and grumbles often associated with long distance, high speed touring. On top of that there is room to strap bags. There are also plenty of handy points to which you can attach bungees. And passengers, as well as being accommodated very comfortably, make not one iota of difference to the performance and have a barely noticeable impact on handling and braking. All of which, I guess makes this oldest of the über-tourers, the best as well as well as the cheapest currently on the market. 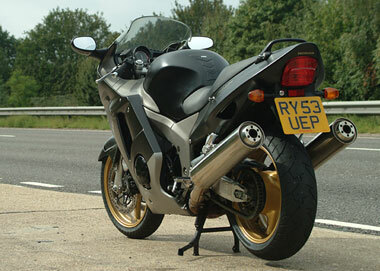 Read external Honda CBR1100XX reviews on ciao.